Let’s park the ‘ethical’ bit for a moment. Because you’re here, it’s a fair assumption you’re already committed to the idea of working with a supplier that’s socially and environmentally responsible. EJA is, and we’ll go into that more later. For now let’s talk about whether we’re right for you. And if so, how we’re going to help you design a ring that will absolutely delight your partner*. *A note on that. We do say ‘for your partner’ throughout. That is how we began. 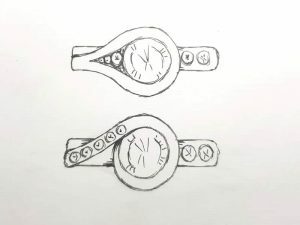 Helping people design rings for someone else. It is still 75% of what we do. But it doesn’t mean we won’t work directly with people who are designing a ring for themselves or as a couple. We find that our customers enjoy the guidance we provide regardless of who the ring is for. Our experience over the past decade or so is that EJA isn’t right for everyone. And we think that’s a good thing. Trying to be all things to all people usually means compromising and we’d rather not do that. Why aren’t we right for everyone? It’s not about the designs or pricing or anything like that. Mostly it’s because EJA works almost exclusively online and not everyone is comfortable with that. Operating online means we don’t have a physical showroom. We choose not to have a shopfront because our type of business doesn’t need one. And besides it would add unnecessary overheads that we’d have to pass on to you. If you’re not comfortable with the idea that you can’t visit somewhere to look at physical examples of our work, then we’re probably not right for you. Of course, it doesn’t mean we can’t or won’t meet with you, or that you can’t pick up the phone and talk to us one-on-one. You most certainly can. But as it turns out, the people who enjoy working with us most are those who are comfortable using email as the main way of communicating. We’ve found this works especially well for people not in easy reach of a jeweller they have confidence in. Or those who are just plain busy and appreciate being able to communicate with us when it suits them. Take a look at our testimonials section. You’ll see we have customers from all over Australia – Melbourne, Sydney, Brisbane, Adelaide, Perth, Darwin and lots of places in between. Thank you so much for my stunning engagement ring! We had a specific idea in mind that was not like anything we found in the shops and you have turned it into reality… and even more beautiful than we imagined! The whole process was so exciting, and a bit nerve wracking because we couldn’t show you a picture, but you expertly guided us through and interpreted our ideas perfectly. It was really important to us that the diamond and metal was ethically sourced and locally made so thank you for that as well; and it didn’t even cost any more than a shop bought alternative! One of the nicest things about your service is that I felt totally comfortable expressing every niggle or worry and you listened and took these on board. We can’t thank you enough for a ring that will be cherished for the rest of our lives. How do you get what you want if we don’t meet? If you’re the kind of person who prefers to work face-to-face, then you might struggle with this idea. On the upside though, there’s no pressure on you to make hasty decisions and the process is very time efficient. Here’s the thing. Because most of the engagement and commitment rings we make are going to be a surprise to the person who’ll receive it, we don’t get to meet the wearer anyway. What that means is regardless of whether we have a shop front or not, we’ve had to get really good at helping our customers come up with a design for their partner without ever meeting that person. Experience tells us we can do that successfully by email and over the phone. But like we said, it doesn’t work for everyone. How do we help you design the perfect ring for your partner? The short answer is, it’s all about asking the right questions and paying attention to what you want. It’s not that hard. From time to time we do meet customers who already know exactly what they want, but that’s pretty rare. Most people who come to us just know they want a special ring and have a bit of an idea about their budget. Beyond that they’re pretty vague, often daunted and are looking for someone to help them make good decisions. That’s where our detective skills come in to play. It’s all about asking the right questions. You might not think you know what your partner will like, but you’ll be surprised at how quickly we can zero in on some of the key design factors. Using your budget to set some limits, we consider things like your partner’s style and personality, their skin tone, the size of their fingers and hands, the colours they like to wear and their occupation and hobbies. All of these things start to point us in a particular direction, narrowing down the possibilities. Then we can show you images of designs we think are close to what your partner will like. Next we work closely with you to customise those designs until together we come up with something that suits your partner perfectly. Making good decisions is about being informed. That’s why we’re an open book when it comes to sharing information with you. On this site you’ll find information about choosing diamonds and gemstones, precious metals, design ideas, practical considerations and getting the best bang-for-buck. And importantly it’s all freely available to your whether or not you decide to use EJA as your jeweller. One of the best places to start is by downloading our free Engagement Ring Design Guide. At over 70 pages, it’s packed with design considerations, ring styles, photographs and information that will answer pretty much all of your questions – and some you didn’t even know you needed to ask. If you’re in the market for wedding or commitment rings, there’s a Buyer’s Guide for those too. Without jumping up on a soapbox, for those in the know, the jewellery industry supply chain is notorious for environmental damage, workforce exploitation and criminal corruption. Things look all bright and shiny at the retail end. But there’s a lot that goes on behind the scenes that’s pretty grubby. We’re here so you don’t inadvertently contribute to the problems that already exist. Precious metal mining and processing uses plenty of toxic materials – mostly mercury and cyanide. These often escape into the environment or are carelessly dumped. Mining itself degrades the local area through habitat destruction and erosion that can have far reaching effects. Exploitation of workers is common too – and is perhaps a much bigger problem. In particular, child labour is often used, both in the mining operations and in cutting factories where the keen eyesight and dexterity of a child is highly valued. That’s why we take great care in selecting our suppliers. We work hard to ensure our products are as ethically and morally responsible as possible. We use almost exclusively recycled precious metals – gold, platinum and palladium. Recycling is responsible and the refiners we use are audited and screen their suppliers to ensure they’re not associated with any criminal or unethical activities. There are also certified environmental protections in place to ensure recyclers do no harm to the environment. The supply is plentiful and the quality is the same as newly mined metals. By the way, when asked, we can supply ethically sourced mined gold from Artisanal Small-scale Mining communities. We take great care to ensure that all our diamond and gemstone suppliers can verify the sources of their stones. And that they can guarantee no exploitation of labour or money laundering in their production. And again, to ensure there’s no exploitation and to keep the carbon cost down, all our handmade engagement and wedding rings (and non-ring jewellery) are Australian made. We support local industry whenever possible. Sound like the right fit for you?